In the early World War II years, the Hughes Aircraft Company (HAC) worked to design and build its D-2 aircraft intended for a variety of roles. However, the United States Army Air Force (AAF) was not truly interested in the twin-engine wooded aircraft. To cure design deficiencies and make the aircraft more appealing to the AAF, HAC proposed a redesign of the D-2, designated D-5. The initial D-5 design was an enlarged D-2 and employed Duramold construction using resin-impregnated layers of wood, molded to shape under pressure and heat. The proposed aircraft had a 92 ft (28.0 m) wingspan, was 58 ft (17.7 m) in length, and weighed 36,400 lb (16,511 kg). The D-5 was powered by Pratt & Whitney (P&W) R-2800 engines and had a forecasted top speed of 488 mph (785 km/h) at 30,000 ft (9,144 m) and 451 mph (726 km/h) at 36,000 ft (10,973 m). A 4,000 lb (1,814 kg) bomb load could be carried in an internal bay. The AAF was still not interested in the aircraft and felt that HAC did not have the capability to manufacture such an aircraft in large numbers. In early August 1943, Col. Elliot Roosevelt, President Franklin Roosevelt’s son, was in the Los Angeles inquiring with various aircraft manufacturers to find a photo-reconnaissance aircraft. Col. Roosevelt, who had previously commanded a reconnaissance unit, was hosted by Hughes and taken on a personal tour of the D-2. At the time, the aircraft was undergoing modification to become the D-5 and was not available for flight, but Col. Roosevelt was sufficiently impressed. General Henry “Hap” Arnold of the AAF was put under pressure from the White House to order the D-5 reconnaissance aircraft into production. To ease the AAF’s concerns about the D-5’s Duramold construction, the design was changed to metal wings and tail booms and only the fuselage built from Durmold. Arnold made the decision to order the D-5 aircraft “much against [his] better judgment and the advice of [his] staff.” The AAF issued a letter of intent on 6 October 1943 for the purchase of 100 examples of the D-5 reconnaissance aircraft. An official contract for the aircraft, designated F-11, was issued on 5 May 1944. Two aircraft would serve as prototypes with the remaining 98 aircraft as production versions. 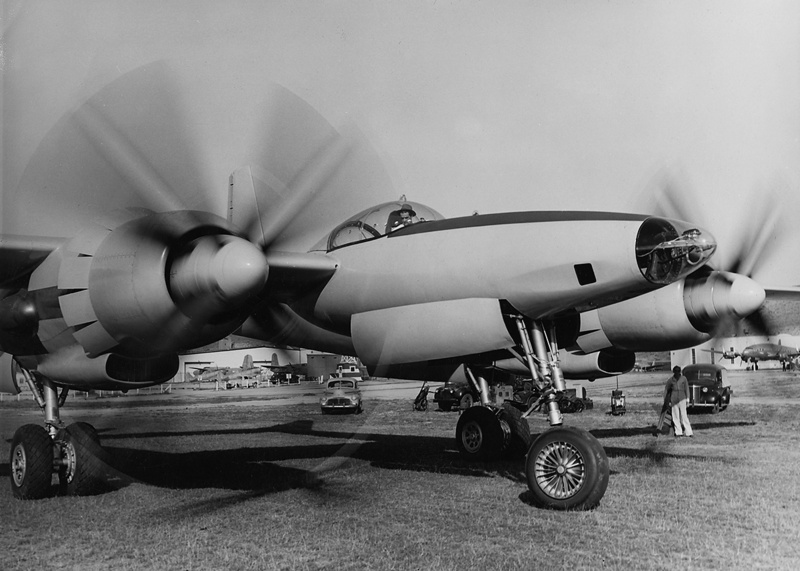 As contracted, the Hughes XF-11 prototypes were of an all-metal construction and powered by two P&W R-4360 engines. The aircraft had the same layout as the Lockheed P-38 Lightning but was much larger. The fuselage consisted of a streamlined nacelle mounted to the center of the wing. At the front of the fuselage were provisions for photographic equipment. The cockpit was positioned just before the wing’s leading edge, and the cockpit was covered by a large, fixed bubble canopy. The pressurized cockpit could maintain an altitude of 10,500 ft (3,200 m) up an aircraft altitude of 33,500 ft (10,211 m). Entry to the cockpit was via a hatch and extendable ladder just behind the nose wheel landing gear well. 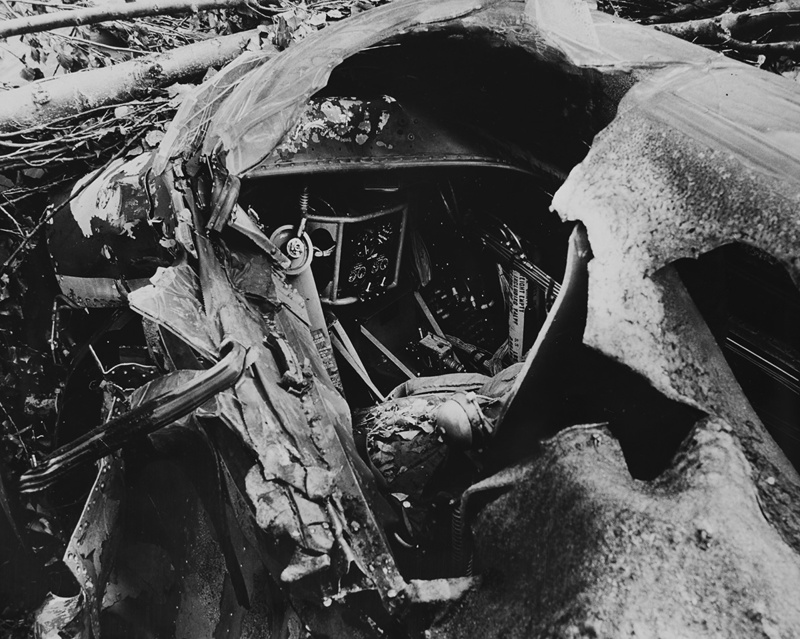 The pilot’s seat was offset slightly to the left. Behind and to the right of the pilot sat a second crew member, who would fulfill the role of a navigator/photographer. The second crew member could crawl past the pilot and into the aircraft’s nose to service the cameras while in flight. The nose landing gear retracted to the rear and was stowed under the cockpit. The XF-11’s wings had a straight leading and trailing edges, with the leading edge swept back approximately 6 degrees and the trailing edge swept forward around 3.5 degrees. Mounted to each wing about a third of the distance from the fuselage to the wing tip was the engine. The engine nacelle was slung under the wing and extended back to the aircraft’s tail. A large flap was located on the wing’s trailing edge between the tail booms. Each wing had an addition flap that extended from outside of the tail boom to near the wing tip. Relatively small ailerons spanned the approximate 66 in (1.68 m) distance from the flap to the wing tip. The aircraft’s main source of roll control were spoilers positioned on the upper surface of the outer wing and in front of the flap. Each wing incorporated a hardpoint outside of the tail boom for a 700 gallon (2,650 L) drop tank, and 600 gallon (2,271 L) jettisonable tip tanks were proposed but not included on the prototype aircraft. Each 3,000 hp (2,237 kW), 28-cylinder R-4360 engine was installed in the front of the wing and was housed in a streamlined cowling. Cowl flaps for engine cooling circled the sides and top of the cowling. Under the engine nacelle was a scoop that housed the oil cooler and provided air to the intercooler and the two General Electric BH-1 turbosuperchargers installed in each tail boom. Air that flowed through the oil cooler exited at the back of the scoop. Air that flowed through the intercooler was routed to an exit door on top of the engine nacelle, just above the wing’s leading edge. Exhaust from the superchargers was expelled from the sides of the engine nacelle, just under the wing. The turbosupercharger on the inner side of each tail boom could be shut down during cruise flight to take full advantage of the remaining turbosupercharger operating at its maximum performance. The main landing gear was positioned behind the engine and retracted to the rear into the tail boom. Attached to the end of each tail boom was a large, 11 ft 8 in (3.56 m) tall vertical stabilizer. Mounted in the 25 ft 8 in (7.82 m) space between the vertical stabilizers was the horizontal stabilizer. The left tail boom housed additional camera equipment behind the main landing gear well. 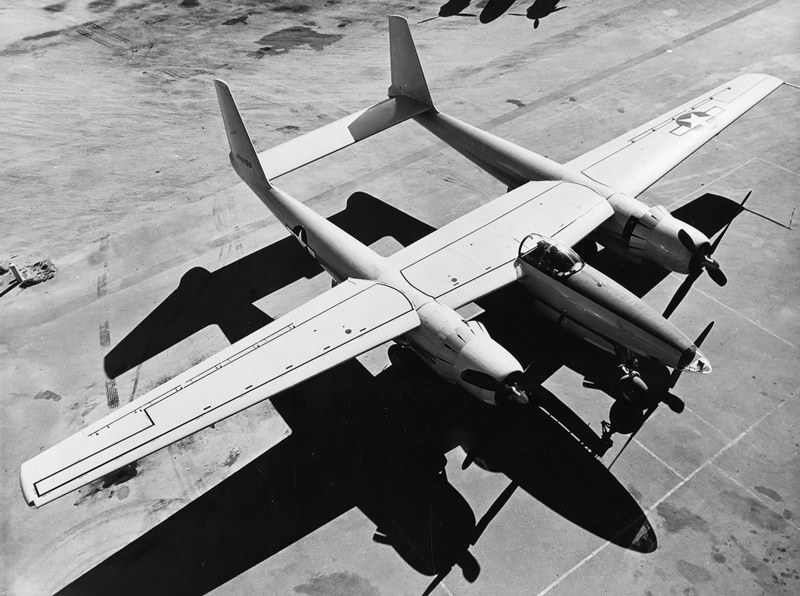 The XF-11 had a wingspan of 101 ft 4 in (30.9 m), a length of 65 ft 5 in (19.9 m), and a height of 23 ft 3 (7.09 m). The aircraft had a top speed of 450 mph (725 km/h) at 33,000 ft (10,058 m) and 295 mph (475 km/h) at sea level. The XF-11 had a service ceiling of 42,000 ft (12,802 m), an initial climb rate of 2,025 fpm (10.3 m/s) and could climb to 33,000 ft (10,058 m) in 17.4 minutes. The aircraft had an empty weight of 39,278 lb (17,816 kg) and a maximum weight of 58,315 lb (26,451 kg). 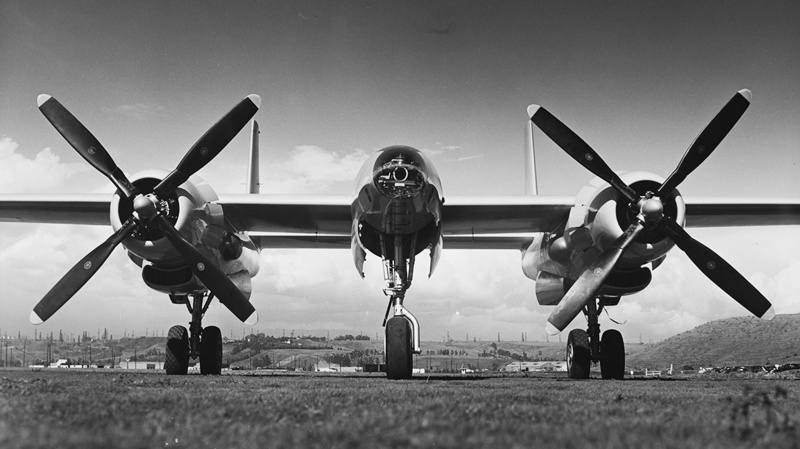 With its 2,105 gallon (7,968 L) internal fuel load, the XF-11 had a 5,000 mile (8,047 km) maximum range. Delivery of the first XF-11 (44-70155) was originally scheduled for November 1944 with peak production of 10 aircraft per month being reached in March 1945—an ambitions timeline for any aircraft manufacturer. Delays were encountered almost immediately and gave credence to the AAF’s belief that HAC was not up to the task of designing and manufacturing aircraft for series production. By mid-1945, the XF-11 had still not flown, and the war was winding down. It was clear that the XF-11 would not be involved in World War II, and there was much doubt as to the usefulness of the aircraft post-war. As a result, the order for 98 production examples was cancelled on 26 May 1945, but the construction of the two prototypes was to proceed. 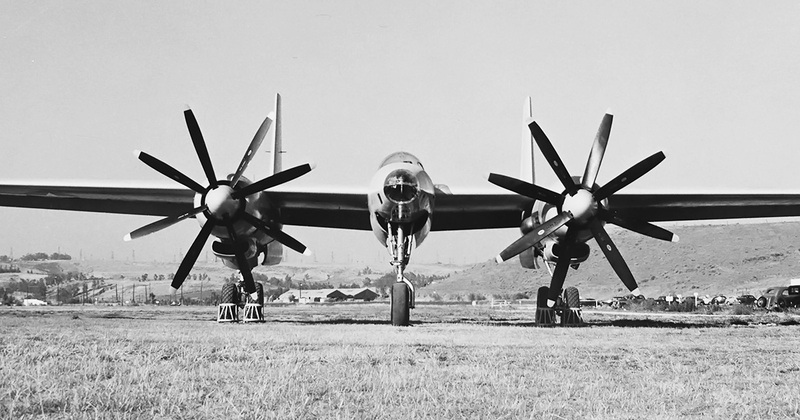 The first XF-11 prototype was fitted with Hamilton-Standard Superhydromatic contra-rotating propellers. The front four-blade propeller was 15 ft 1 in (4.60 m) in diameter, and the rear four-blade propeller was 2 in (51 mm) longer at 15 ft and 3 in (4.65 m) in diameter. The impressive aircraft was finally finished by April 1946 and began taxi test. With Howard Hughes at the controls, an aborted high-speed taxi test on 15 April resulted in some minor damage and the need to rework some of the aircraft’s systems. 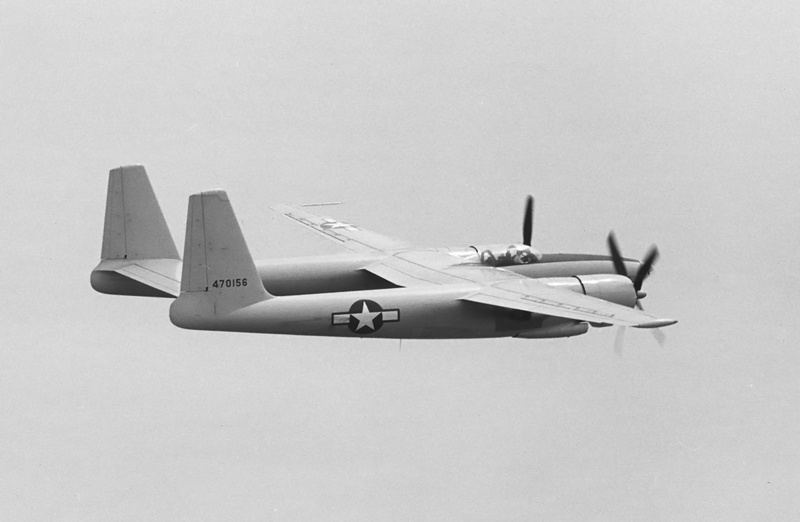 Once repaired, Hughes decided to make the XF-11’s first flight on 7 July 1946. 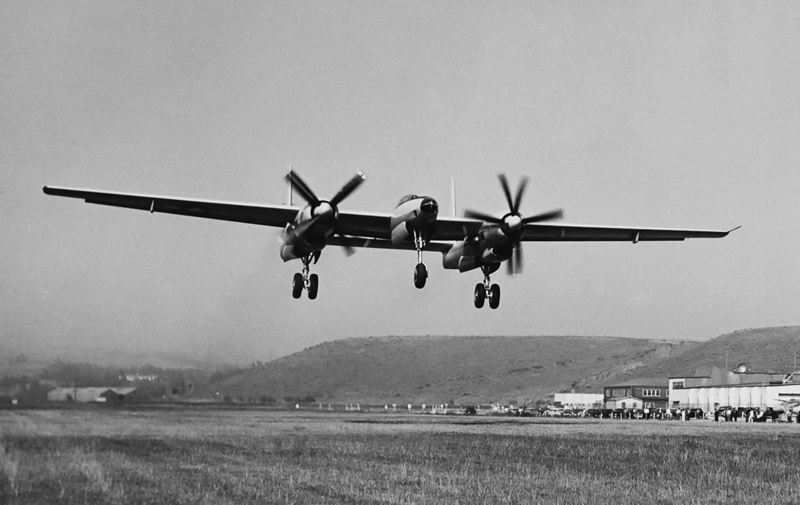 The AAF had stipulated that the XF-11’s first flight should be no more that 45 minutes, the landing gear should not be retracted, the aircraft should stay near the airport and away from populated areas, communication should be established with the chase plane, and the flight should follow the plan discussed beforehand. While the flight was discussed with some, many involved with the aircraft were unaware of Hughes’ plans. Had his intentions been better known, someone may have reminded him about the propeller seal leak on the right engine. Hughes request 1,200 gallons (4,542 L) of fuel to be on board, which was twice as much as should be needed for the scheduled 45-minute flight. HAC’s Douglas A-20 Havoc would serve as a chase plane for the flight, but radio issues prevented communication between the two aircraft. 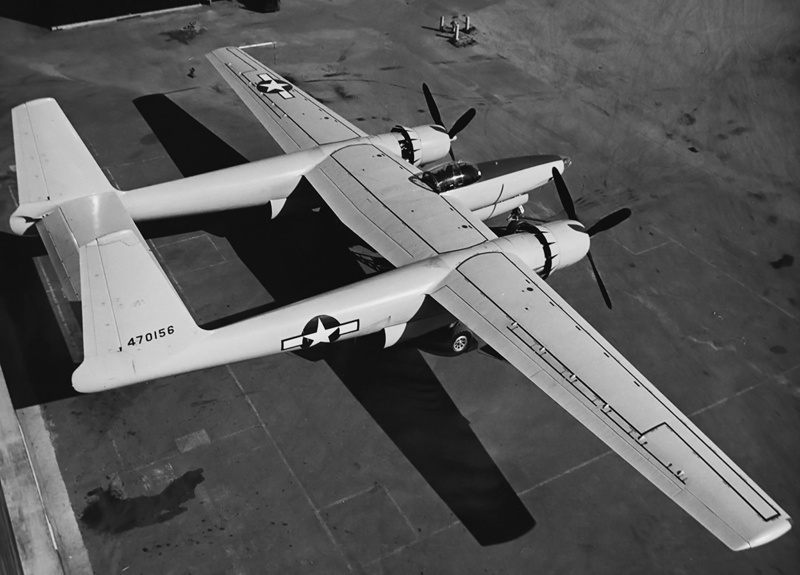 At around 5:20 PM, Hughes took the XF-11 off from Hughes Airport in Culver City, California on its maiden flight. Shortly after takeoff, Hughes retracted the gar, and the right main light remined illuminated, indicating a possible issue with the retraction. Hughes and the XF-11 flew out over the Pacific Ocean and turned back toward land. The landing gear was cycled several times during the flight in an attempt to resolve the perceived issue on account of the illuminated light. After about an hour and 15 minutes, the oil supply in the right propeller was exhausted and the rear set of blades moved into a flat or reversed pitch. Had Hughes stuck to the 45-minute flight as the AAF ordered, the oil supply would not have been depleted. The reversed pitch propeller created a massive amount of drag on the right side of the aircraft. To the A-20 chase plane, it appeared that Hughes was maneuvering to land back at Culver City, some distance away. The chase plane broke formation to return to the airfield on its own. Had the two aircraft been in communication, the situation could have been discussed. Hughes, now alone, believed that the right main gear had deployed on its own and was causing the drag. Had Hughes left the gear down, he would have known the drag was a result of some other issue with the aircraft. Trying to keep the XF-11 straight resulted in the deployment of the left-wing spoilers, which further slowed the aircraft. Low, slow, and over a populated area, Hughes tried to make it to the open space of the Los Angles Country Club golf course in Beverly Hills. Landing short, the XF-11 crashed into four houses, broke apart, and caught fire. Hughes managed to pull himself from the wreckage, where he was helped further by neighborhood residents and arriving paramedics. Hughes suffers major injuries, including severe burns, at least 11 broken ribs, a punctured lung, and a displaced heart. Remarkably, he made a near-full recovery, but the incident started an addiction to codine, which would cause Hughes problems throughout the rest of his life. Construction of the second XF-11 prototype (44-70156) continued after the accident. The second prototype used single rotation, four-blade propellers that were 14 ft 8 in (4.47 m) in diameter and made by Curtis Electric. Despite all of the new rules implemented because of his crash, Hughes was adamant that he pilot the first flight of the second XF-11 prototype. The AAF initially refused, but Hughes pressed the issue and made personal appeals to Lt.Gen. Ira Eaker and Gen. Carl Spaatz. Hughes also offered to put up a $5 million bond payable to the AAF if he crashed. With the posting of the bond, the AAF gave in. On 4 April 1947, Hughes flew the second XF-11 on its first flight, taking off from Hughes Airport. The flight was a personal victory for Hughes. The second XF-11 was later delivered to the AAF at Wright Field, Ohio in November 1947. After further flight tests, the aircraft went to Eglin Air Force Base in Florida. 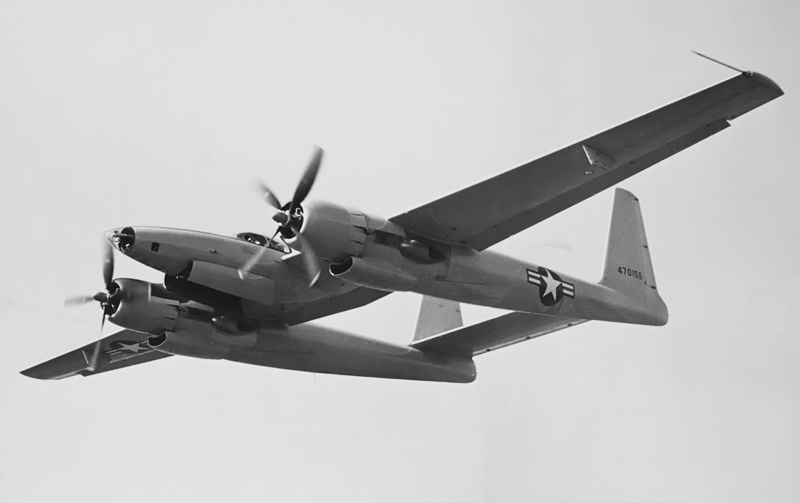 The XF-11 was noted for having good flight characteristics, but in-flight access of the camera equipment was extremely difficult and some of the aircraft’s systems were unreliable. In 1948, the aircraft was redesignated XR-11 in accordance to the new Air Force designation system. The XF-11 was tested at Eglin from December 1947 through July 1949. Other, existing aircraft, mainly Boeing RB-29s and RB-50s, were serving in the reconnaissance role intended for the XF-11. These aircraft proved much less expensive than the XF-11, making the impressive and powerful XF-11 irrelevant. While the XF-11 probably could have done the reconnaissance job better, money was tight in the post-war years and there were other, more-promising projects to fund. The XF-11 was transferred to Sheppard Air Force Base in Wichita Falls, Texas on 26 July 1949 and subsequently served as a ground training aid, never flying again. The aircraft was struck from the Air Force’s inventory in November 1949 and was eventually scrapped. This entry was posted in Aircraft, World War II on 20 December 2018 by William Pearce. One of my favorites. Nice job, Bill! Thank you Tom. One of my favorites too. Who wouldn’t like an aircraft the size of the B-17 with the speed of a P-51?